With the growing concern over asbestos, many of our customers are faced with the dilemma of what to do once their old corrugated roof starts to deteriorate. We recommend removing the asbestos and replacing with Plastic Coated Steel Box Profile Sheeting. For more information regarding ASBESTOS, please see our FAQ page or for a free no obligation quotation please contact us or email us now. Click here. 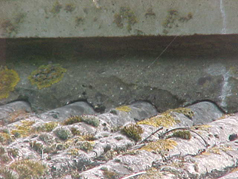 Asbestos cement is a mixture of cement and asbestos (usually about 10-15% of the total product) forming a hard material often used as corrugated roofing on sheds, garages, farm buildings and industrial units. Asbestos cement usually contained white asbestos (chrysotile) but older types may contain blue (crocidolite) or brown (amosite). The type used is not really important as all asbestos is hazardous, although asbestos cement does not release many fibres and is relatively low risk. It is sometimes difficult to tell the difference between an asbestos cement product and a low-density insulation board. 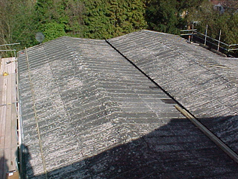 Where the product has been used as a roofing or cladding product open to the weather, you can be confident that the product is asbestos cement. 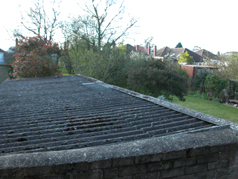 Your roof is made with Asbestos Cement and therefore a licence is not needed to remove it. However, in compliance with HSE, All Roofing and Building is highly experienced in handling the product and fully aware of the strict guidelines that must be followed to remove and dispose of the product correctly. A licensed contractor is only needed to work on High Risk Asbestos such as pipe insulation or insulation panels – NOT on Asbestos cement which is much less dangerous. 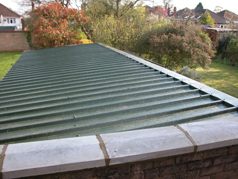 Plastic Coated Steel Box Profile Sheets are the ideal choice when replacing an asbestos roof. We arrange for the asbestos to be removed in accordance with the correct statutory regulations and by following a code of strict Health and Safety Executive Guidance Notes. We inspect the roof to ensure the timber structure is sound prior to installation. The Galvanised Steel Sheets are Plastic coated and come in a selection of colours; they are adhered with the use of 8mm Hexi bolts. Insulation and additional lighting in the form of dome roof lights or grp sheeting are further options to consider depending on the building use. EPDM is an alternative to a corrugated system and provides the new roof with a completely new finish. We arrange for the asbestos to be removed as in accordance with the correct statutory regulations and by following a code of strict Health and Safety Executive Guidance Notes. 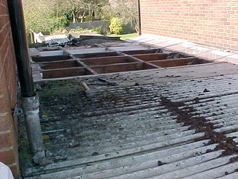 Following an inspection of the timber structure, we treat and install any necessary timbers and lay additional decking. 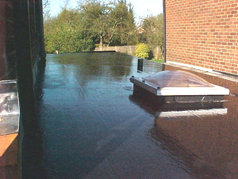 Then the EPDM is applied in the approved way. 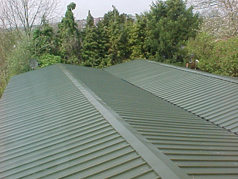 Overcladding avoids the need to remove the existing roofing sheets and in the case of asbestos roofs, minimises the health and safety risks involved in the handling and the disposal of them. The existing fragile corrugated roof will require a thorough inspection to ensure the structure is in a sound condition and any deterioration rectified. Timber is laid over the existing roof that the new corrugated overclad roofing sheets can be mechanically fixed to it. This system is mainly used on commercial pitched roofs where it is safe to keep the existing sheeting in place. For more information regarding Asbestos, please see our FAQ page or for a free no obligation quotation please contact us or email us now. Be your project Large or Small, Commercial or Domestic, let us offer you a free no obligation quotation. ©2008 All Roofing and Building Ltd. Website designed by Bravo. AMC Roofing is based in High Wycombe, Buckinghamshire (Bucks) and is an authorised Firestone installer of EPDM One Piece Rubber Roofing, single ply roofing, SLate and Tile Roof installation services, asbestos and asbestos cement removeal and replacement, uPVC or Timber guttering, fascia, soffits, cladding, skylights, grp, metal roofs to private and industrial markets. Our company services all areas within 60+ mile radius of High Wycombe, including Oxford, Aylesbury, Hemel Hempstead, Watford, Slough and Reading (Hertfordshire (Herts), London and Berkshire (Berks) included.